Time is your main enemy in VP. I mentioned at least a few times how great this game looks. The car models are just phenomenal, with just enough polygons to sell the illusion, but not so many as to bog down the CPU. Each car sports gray-shaded, translucent windows, RR4-style brake-light streaks, and a tasteful amount of reflection mapping on the body. Thank you, Clockwork, for taking a sensible approach to reflection mapping, and for not giving us ultra-shiny cars like the ones Genki tried to sell us in Tokyo Xtreme Racer. And despite the nice detailing, many of them can be on the screen at one time, all at a near-constant 60 frames per second. Clockwork did a great job of building just the right amount of detail into each model without choking the CPU. More than a few times I've witnessed 3-car pileups while 5 other cars try to weave around the carnage, all with very little or no slowdown. The courses are no slouches, either. At some point Clockwork decided framerate coupled with cleverly-rendered detail was essential to selling their environments, and what a great job they've done! I can tell their process was a precarious balancing act, involving any number of tough trade-offs, but the overall effect is just superb. 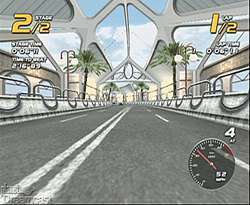 Had Sony given Namco a friendlier development environment, Ridge Racer 5 might have looked a lot like Vanishing Point. VP's rendering engine paints every detail, every luscious environment, at 60 frames per second with barely any hiccups or stutters. And Clockwork can do this because they made insanely smart decisions about which technique they would use to render whatever detail. For example, every hill, every rock face is made up of low-poly models and mapped with deep and exquisite textures. All the trees are cross-poly. And many architectural details, including decorative steel beams and support-bridge cables, are made out of flats, out of cleverly utilized chroma-keyed textures. Do they really have these wacky indoor sections in real races? I doubt it. I should also mention the music, which is well crafted, and reminiscent of R4's airy techno-pop. It suits VP's frenetic action quite well, and, although every tune adheres to a consistent style, it never quite gets on the nerves. In fact, its pace is almost hypnotic, making the game seem just a little "faster." Vanishing Point gets a lot of high marks from me, but there's one thing in particular which drags this game down, and that's the AI. 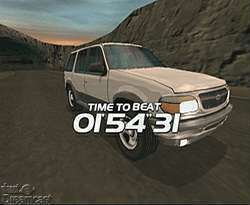 The game demands that I race around any one of 8 awesome tracks at breakneck speed, and insists that my only real opponent is the clock. Like me, every one of my rivals is racing for the best time around each track. That being the case, why do my rivals slow down in order to ram me into a wall? Shouldn't they be concerned with trying to bleed off as little speed as possible? If I were racing against the clock in the real world, my rivals might try to dominate the optimal racing line; they might even try to squeeze me out of the inside track, but they sure as hell wouldn't blow their lap times trying to ram me off the road. As for the everyday-Joe drivers who share the track with us speed addicts, their AI is every bit as backward as my rivals' AI. If he spots a fast and reckless driver (that's you) approaching from behind, every civilian driver in Vanishing Point, every single one I swear and you can count on it, will slow down. Will slam on his brakes. What the... I don't get.... I mean, in the real world, were I to spot some super-fast and insane driver in my rear view, I would speed up to avoid his rear collision, and I would steer the hell out of his way. I would NOT (nor, I presume, would anyone reading this article) slam... on... my... brakes. It boggles the mind. Vanishing Point remains a blazing fast, satisfying and addictive racing game. Unfortunately, before you can really enjoy it, you'll need to find a way to work around the trash AI. You know how RE: Code Veronica rocked hard, even though Claire's movements were tied to the digital pad? (No, I still can't get over that.) Vanishing Point is sort of like that. Its flaws prevent it from becoming the next big thing, but it's still a very worthy addition to any racing fan's collection. And at the very least, it'll tide you over until Metropolis Street Racer. Highs: Fun racing reminiscent of R4, solid graphics, good control, decent music. Lows: Goes too far with the unlocking, bastardly AI.